Unfortunately time constraints (i.e my day job) keep getting in the way of me updating this site so all Ive been able to do so far for the Portsmouth Nickname page is a very basic bit of background. 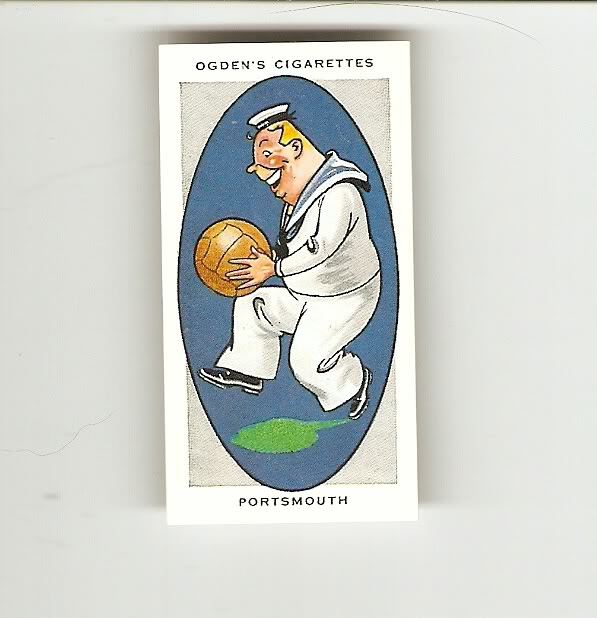 Ive shown below a football cigarette card from the Ogdens AFC Nicknames series that shows a caricature that probably makes any Portsmouth fan cringe with embarrassment as its no exactly the most flattering of images .... an obviously jolly gay sailor !! "Portsmouth draws a great many supporters from the Navy and the club is always depicted as a Sailor. In the early part of the season at Fratton Park, the white caps of the naval men stand out conspicuously in the crowd which througout the year is largely a uniform one. Members of the old Sourthern League,they started on the lowest rung of the Football Legue ladder, going up in to the Second Division in 1924, and to the First three years later. They have become one of the most stylish teams in the country, and in 1929 contested the Final of the Cup competetition, being beaten by Bolton Wanderers". So,no mention of the famous Pompey Nickname there then !! Dont worry though I will be coming back to this page to expand on this particular football nickname a bit more ! !